The 12 Day Or Less MRSA Eradication System is a new program created by Christine Dawson that covers effective and natural ways to treat and prevent the spread of MRSA or staph infections. The program also reveals to people natural staph infection remedies, safe methods, secret ingredients, proper diet plans for MRSA infection sufferers. The 12 Day Or Less MRSA Eradication System is the product of Christines hard work. She used it to cure herself, and she now uses it to help cure others. The package is composed of 3 reports that tackle different aspects of MRSA infection. The core book of the package is How I Stopped 3 Years of Chronic MRSA Infections. This explains everything that Christine did to put an end to the attacks. Since Christine Dawson released the program, she has received many positive comments from customers. For most users the methods inside this book will rebalance theirs skin natural complexion, so they will completely can forget about nasty MRSA infection ever existed. Reports of penicillin resistance in S. aureus began to appear within only a few years of the introduction of penicillin in the early 1940s, and now, 60 years later, virtually all staphylococcal strains have acquired genes that allow them to produce b-lactamases that make them resistant to the natural penicillins, aminopenicillins, and the so-called anti-pseudomonal penicillins (insert reference). Oxacillin and methicillin were developed and successfully used clinically in the early 1960s, but over relatively short periods of time, resistance to oxacillin and methicillin emerged. Similar to penicillin-resistant organisms, these strains, collectively called methicillin-resistant S. aureus or MRSA have appeared and spread, in a clonal fashion, initially within the hospital environment and more recently in the community, where new strains have been described. The Nosocomial Infections Surveillance System (http www.cdc.gov ncidod hip NNIS 2004NNISreport.pdf) recognizes S. aureus and CoNS (coagulase-negative staphylococci, i.e., S. epidermidis and most other staphylococci other than S. aureus) as the most frequently isolated nosocomial pathogens from intensive care unit patients. An extremely high percentage of these isolates are resistant to methicillin (89 CoNS compared to 59.5 for S. epidermidis). In addition to specific antibiotic resistance, which is based on the acquisition of genetic resistance factors and may be chromosomally, or more often plasmid-encoded, staphylococci have nonspecific mechanisms of resistance, of which biofilm formation is undoubtedly the most important. In contrast to many other medical biofilms, such as multispecies dental plaque formation, biofilm-associated infections with staphylococci are usually not mixed with other species (Arciola et al. 2005). In addition, it is rare to find more than one strain in an infection. A possible explanation for this phenomenon is interspecies communication by quorum-sensing signals, which in staphylococci leads to inter-species inhibition of virulence factor expression (Ji et al. 1997). Similarly, bacterial interference by quorum-sensing signals may explain why P. aeruginosa outgrows S. aureus and other bacterial pathogens in progressed lung infections (Renders et al. 2001 Qazi et al. 2006). However, these phenomena are poorly understood and there may be a simpler explanation based on the evolutionary adaptation of the bacteria to a specific environment, such as of S. epidermidis on the skin. Oligonucleotides able to hybridize with complementary target sequences. PCR-amplified products are detectable with low-density oligoarrays, enabling the parallel detection of several targets during the same experiment. The basic principle of DNA probe technology is hybridization, relying on denaturation of double-stranded DNA and detection of hybridized labeled-DNA. Recent reports relying on ribosomal or other specific markers demonstrated the identification of Staphylococcus at the species level (Hamels et al., 2001 Couzinet et al., 2005a) and even provided an overview of the virulence factors harbored by clinical isolates during the same experiment (Saunders et al., 2004 Couzinet et al., 2005b). Methicillin-resistant Staphylococcus aureus (MRSA) is typical of the burden of antimicrobial resistance in nosocomial infections. S. aureus is one of the most frequent nosocomial pathogens, and the prevalence of methicillin resistance has been constantly rising among S. aureus strains over the last four decades. This has been responsible for an increase in length of hospital stay, treatment-related complications, costs, and, in some instances, attributable mortality. Because MRSA, like methicillin-susceptible S. aureus (MSSA), frequently colonizes the skin, it is of particular concern as a cause of infection in surgical patients. However, the antibiotics commonly recommended for perioperative prophylaxis do not target MRSA. Therefore, one can legitimately wonder if current preventive measures are still sufficient. MRSA and MSSA infections share common pathogenic mechanisms. Although asymptomatic nasal colonization with S. aureus is common, it appears to be an important factor in the development of most infections due to this organism (vonEiff etal. 2001). Conflicting results have been published on risk factors for nasal carriage in patients. In the context of a clinical trial evaluating whether mupirocin prevented surgical site infections due to S. aureus, Herwaldt et al. prospectively collected data on 70 characteristics in a population of 4030 patients before surgery. Twenty-two percent of these patients carried S. aureus in their nares the proportion of MRSA was not specified. Independent risk factors for S. aureus nasal carriage were obesity, male gender, and a history of cerebrovascular accident (Herwaldt et al. 2004). Several common blood isolates are almost always significant Staphylococcus aureus, Escherichia coli, and other members of the family Enterobacteriaceae, Pseudomonas aeruginosa, and Candida albicans. In contrast, common skin organisms, such as coagulase-negative staphylococci (CoNS), Coryneform bacilli, alpha-hemolytic streptococci, and Propionibacterium acne, are frequent contaminants. However, with many patients carrying an intravascular device that is prone to colonization and infection, each positive culture entails clinical correlation with other findings and sound judgment to make final assessment (Mirrett et al., 2001 Weinstein, 2003). Quorum-sensing mechanisms in S. aureus differ from those already described but achieve similar objectives (Ji, Beavis and Novick 1995). Many staphylococcal virulence factors are regulated by the agr group of genes, which allow the transcription of genes responsible for encoding a variety of toxins. It is conceivable that staphylococci originally concentrate their genetic expression on adherence at a primary site before quorum-sensing molecules signal that the required growth density has been achieved. Thereafter, a genetic switch is triggered in order to activate the agr locus and thus secretion of known virulence determinants such as a-toxin, p-toxin, and 8-toxin (Recse et al. 1986). It is known that bacteria in biofilms are more resistant to treatment with antimicrobial agents than the corresponding free-living or planktonic cells (Donlan 2002). 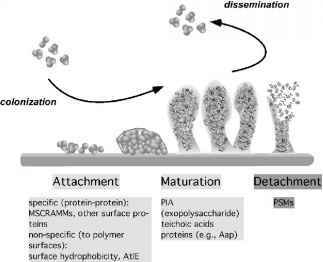 Drug-resistant E. coli biofims have been shown to exhibit p-lactamase activity, enhancing resistance to antibiotics such as imipenem and cefoxitin (He, Li and Li 2001). Small-colony variants of staphylococci within biofilms may be highly resistant to the bactericidal action of oxacillin or vancomycin (Chuard et al. 1997). It appears that a fraction of cells within a biofilm population will always exhibit a resistant phenotype (Meyer 2003) these bacteria are often termed persister cells (Keren et al. 2004). Studies have suggested that persisters are neither defective cells nor cells created in response to antibiotics, but are rather specialized survivor cells. Keren et al. (2004) showed that tolerance of E. coli to ampicillin and ofloxacin is due to persister cells. With respect to CAP caused by S. aureus, Hageman recently reported 17 cases of culture-confirmed community-acquired S. aureus pneumonia among persons with either an influenza-like illness (i.e. fever plus sore throat or cough) or laboratory-confirmed influenza infection before onset of pneumonia symptoms 35 . Of the 13 cases from whom S. aureus isolates were available, 11 were methicillin resistant and 10 of these were identified as the USA300 strain, a pulsed-field gel electrophoresis type associated with severe necrotizing pneumonia 54 . Sulbactam-Enterobacter spp., ampicillin sulbactam-Serratia spp., aztreonam-Pseudomonas spp., imipenem-Proteus spp., meropenem-Acinetobacter spp., piperacillin-Acinetobacter spp., piperacillin tazobactam-Acinetobacter spp., linezolid-Enterococcus spp., for resistance and linezolid-Staphylococcus spp for resistance. Alternative methods have to be used for testing these drug-organism combinations. Then individual relevant randomized trials. In a different example, a physician might ask whether early valve replacement will improve the outcome of a patient with Staphylococcus aureus endocarditis. In this case the briefest answer might be found in a narrative review and evidence can be shown in more detail from prospective and then retrospective observational studies. Staphylococcus auresus probes are available for Campylobacter, Enterococcus, Group A Streptococcus (Streptococcus pyogenes), Group B Streptococcus (Streptococcus agalactiae), Haemophilus influenzae, Neisseria gonorrhoeae, Staphylococcus aureus, Listeria monocytogenes, and Streptococcus pneumoniae. The advantage of these assays is they are nonisotopic, simple to use, and have high sensitivity (ranging from 92 to 100 ) and specificity (ranging from 99 to 100 ) (see Table 8.1). Multiple individuals derive data from multiple sources, so there is a potential danger of transcription error, which can be minimized by suitable training. Data, critical for a prescribing decision, may also be missing (unrecorded), e.g., phone call advice from an infection specialist or not included in the data set being collected, e.g., MRSA carriage in a patient with a soft tissue infection treated with vancomycin. Prescribing surveys could certainly be enhanced if microbiological data could be linked directly to the data set. 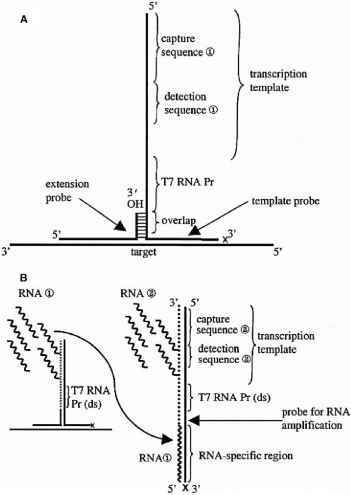 Another similar system, cycling probe technology, uses a unique chimeric DNA-RNA-DNA probe sequence that provides an RNase H sensitive scissile link when hybridized to a complementary target DNA sequence (Duck et al., 1990). The CPT reaction occurs at a constant temperature, which allows the probe to anneal to the target DNA. RNase H cuts the RNA portion of the probes, allowing the cleaved fragments to dissociate from the target DNA. A cycling probe has been designed for detection of a specific sequence with the mecA and vanA B genes, and the former one has been cleared by the Food and Drug Administration for in vitro diagnostic use as a culture confirmation assay for methicillin-resistant Staphylococcus au-reus (Beggs et al., 1996 Cloney et al., 1999 Fong et al., 2000 Modrusan et al., 2000). The application of infection control measures to prevent spread of resistant organisms may never be perfect, and even when control of resistance is nearly perfect there has been a striking lack of correlation of resistance and overall nosocomial infection rates. For example, those countries which have used active surveillance to almost eliminate MRSA have overall nosocomial infection rates similar to those of the United States, where MRSA is often rampant. This suggests that greater emphasis should be placed on prevention of infection, specifically related to devices. Recently, an emergence of infections, mostly skin infection but sporadically severe CAP, caused by so-called community-associated methicillin-resistant S. aureus (CA-MRSA), have been reported from the United States and Europe.64, 65 CA-MRSA are resistant to all p-lactam antibiotics, but are frequently still susceptible to clindamycin, co-trimoxazole, and fluoroquinolones. Group I patients without risk factors, and less than 5 days' hospitalization. Potential microorganisms are methicillin-sensitive Staphylococcus aureus, anaerobes, Haemophilus influenzae, Streptococcus pneumoniae, and Enterobacteriaceae (Escherichia coli, Klebsiella pneumoniae, Enterobacter spp., Proteus spp., Serratia marcescens). Group II patients with risk factors or more than 5 days' hospitalization. The most likely microorganisms isolated would be those present in group I and resistant organisms such as Pseudomonas aeruginosa, Acinetobacter spp., Citrobacter spp., Stenotrophomonas maltophilia, or methicillin-resistant S. aureus (MRSA). The critical factor for changes in the expected flora is prior antimicrobial use (Alvarez-Lerma 1996, Luna et al. 1997, Kollef et al. 1999, Kollef 2000. The patients with the highest risk of developing VAP with endogenic flora are probably those with acute neurologic injuries such as head injury or cardiac arrest. There is a tendency for patients with head injury to be infected colonized by S. aureus. The presence of MRSA needs to be considered in patients with recent hospitalizations or long-term institutionalization (Rello etal. 1992). Mortality from early onset VAP is about 24 . VAP also increases time on mechanical ventilation, ICU and hospital stay, morbidity, and, therefore, associated costs (Heyland et al. 1999). Hospital units with a high prevalence of MRSA, especially if a p-lactam has been previously administered, must include a glycopeptide or linezolid in empiric therapy. Recent data show higher survival rates in patients receiving linezolid than in those receiving vancomycin (80 versus 64 ) (Rubinstein etal. 2001, Wunderink et al. 2003b). Monotherapy should be used when possible, because combination therapy is often expensive and exposes patients to unnecessary antibiotics, thereby increasing the risk of MDR pathogens and adverse outcome. Patients who develop nosocomial pneumonia with no risk factors for drug-resistant organisms are likely to respond to monotherapy. Monotherapy is also the standard when Gram-positive HAP or VAP, including MRSA, is documented. Methicillin resistant Staphylococcus aureus (MRSA), vancomycin resistant ente-rococci (VRE), Acinetobacter spp, and extended spectrum p-lactamase-producing Enterobacteriaceae (ESBL).10-13 The epidemiology and control of such multire-sistant organisms has been the subject of many previous publications and is not within the scope of this review. Suffice to say, they continue to plague many ICUs causing major problems. 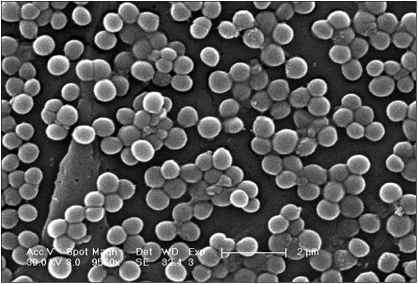 Staphylococcus aureus Staphylococcus aureus (MRSA) common in HAI. In addition to detecting common HAI pathogens, the MDD system for HAI I also detects two targets related to drug resistance the mecA gene and Class I integron. The mecA gene is specific for methicillin-resistant Staphylococcus aureus (MRSA). The Class I integron is commonly seen in Gramnegative bacteria that have resistance to multiple antibiotics. The introduction of protein-conjugate vaccine for Haemophilus influenzae B in the 1990s led to important reductions in this invasive disease 94 . During that same decade, the prevalence of antimicrobial-resistant S. pneumoniae in the United States increased dramatically 95 . This increase reversed following the introduction of pneumococcal conjugate vaccine into the routine infant immunization schedule. Whether this trend will continue or reverse yet again remains to be seen 96 . Perhaps the most novel aspect of a pandemic now or in the future will be the role of community-associated MRSA. As mentioned previously, the increase in prevalence of methicillin resistance among S. aureus isolates has become an important concern among clinicians, both because of the rate of increase in prevalence and because of the dramatic clinical presentations 36-38, 42, 54, 73 . The greatest challenge for the microbiology laboratory in the treatment of infection on the ICU is to make results available on a time scale that can influence treatment and there is reasonable hope that molecular tests will facilitate this. For bacterial infections, however, the only widely available molecular test, commonly relevant to the ICU, is PCR for the mecA gene of MRSA.44 No molecular test is generally available for rapid diagnosis of invasive fungal infection, and while PCR for viral infections is making great inroads, it is outside the scope of this review. It is common now to screen all admissions to the ICU for MRSA. Isolation precautions can then be taken to prevent spread and early decolonization of MRSA-positive patients attempted.50 Early assessment of MRSA carriage status can also inform empiric therapy should it be necessary. It is not impossible that in the future we might experience a global pandemic of some multiply resistant pathogen that seeks to rival the postulated impact of avian influenza. Indeed the impact of any strain of pandemic influenza would be significantly accentuated by MRSA. Events such as this would put antimicrobial resistance firmly on the political agenda and help prioritize the research required for finding another way of treating infection. The sequence of one isolate is not necessarily representative of the species, so there is now a trend toward comparative genomics whereby several isolates of one species are sequenced and compared with each other. For example, seven sequences of Staphylococcus aureus are publicly available, including hospital- and community-acquired MRSA (Diep et al. 2006) and a vancomycin intermediate-level resistant MRSA isolate from Japan (Kuroda etal. 2001). This approach enables comparison between sequence and phenotypic characteristics, particularly for virulence traits and antibiotic resistance, and may ultimately help discover ways to prevent new resistance arising and to find susceptibility in already resistant pathogens.